Fifty-five days before the Games begin in Rio de Janeiro, athletes from around the world are taking part in very different kind of sporting tournament in southern Greece. Think of it as the no-frills Olympics: No national teams. No medals. No shoes. 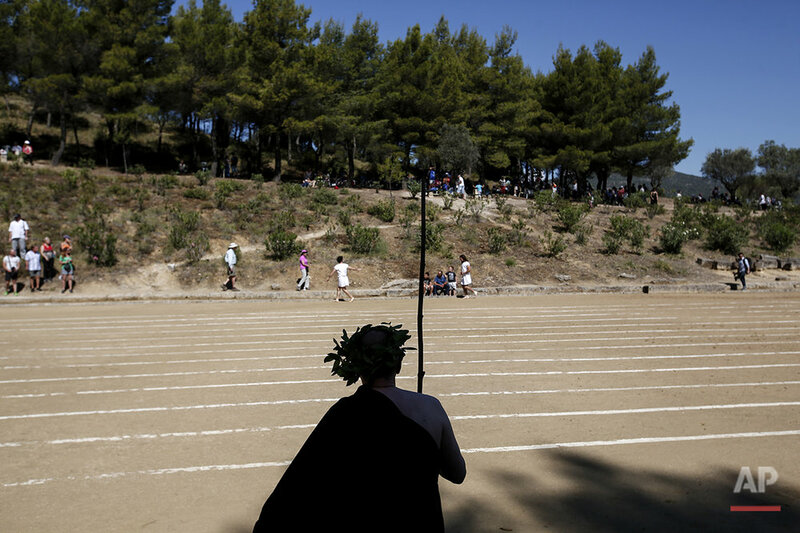 Wearing only white tunics and running barefoot, athletes competed Saturday in the Sixth Modern Nemean Games, a partial revival of ancient Greek games which draws enthusiastic participants aged from 5 to 89. The races, run in age categories, only include a 90-meter sprint on a straight dirt course at a 2,300-year-old stadium and 7.5-kilometer run through fabled olive groves and vineyards in the area, where in ancient Greek mythology Hercules — god of strength, sport and fertility — slayed a fearsome lion. Runners take an oath before competing, and pass through an ancient tunnel to reach the track. A teenage boy, with a red cloak and laurel branch crown on his head, sounds a long horn before each race. Overnight rain delayed the games for 90 minutes and caused some runners to slip in the mud during races. Irish runner Andrew Fortune stayed on his feet to win the print in his age group. A white ribbon was tied behind his head and his feet were cooled in a copper basin. Instead of a starting gun, track officials used a mechanism copied from antiquity: a wood-and-rope starting gate that drops to the ground when the race begins. Runners pick numbered blocks of marble out of a metal drum at random to be assigned their lane. The Nemean Games were revived by an American archaeologist who first came to Nemea in southern Greece in 1973. Stephen G. Miller, professor emeritus of classical archaeology at the University of California, Berkeley, led the excavation when the ancient site still lay buried beneath a highway and vineyards used by raisin farmers. Near the southern city of Corinth, Nemea is steeped in ancient history. The 2,300-year-old Temple of Zeus stands next to the track and a museum built at the site. Miller and his team unearthed the temple and stadium, one of the four major sites where Ancient Greek games were held: Olympia, Delphi, Isthmia and Nemea. The 74-year-old has led the games at Nemea since 1996, a lower-key, more egalitarian affair than the Olympics, in which athletes engage in the no-prize competition with a relatively small but dedicated following. The games attract a mix of Greek and overseas travelers and tourists, history lovers, fitness enthusiasts and school trips. The tunics, held tight with a piece of rope, could be mistaken for hospital gowns and are color-coded: White for athletes, black for track officials, and yellow, green or light blue for other organizers. Miller, in yellow, manned the entrance, checking the names of athletes as they entered the games area. Giving an ancient site a little modern significance, he says, encourages people to learn. "I'm an archaeologist. And what I do is greatly satisfying — to be the first person to see what was made by an ancient Greek 2,300 years ago. But that's self-satisfaction. What does that mean for our society? Nothing," he told the AP in an interview during an interval at the games. "I think here with our games, (people) will learn with physical contact — with the same stones and the same earth that the ancient Greeks touched. I hope they will be inspired to read a little history, to learn something about ancient Greek athletics and through ancient Greek athletics to learn about ancient Greece." Ancient games, held over roughly 1,000 years, were of major significance in Greece, pausing wars between rival city states so that hostilities would not interfere with the competition. Unlike the ancient games and the Aug. 5-21 Rio Olympics, Miller said, Nemea is open to everybody. "We don't rival the Olympic games. We supplement the Olympic games. We extend the experience of the Olympic spirit to everybody," he said. "You don't have to be a great athlete as you do in the Olympics. You can be a common person. You can walk down the track instead of running. But you are part of ancient history." Text from the AP news story, Ahead of Rio, runners re-enact ancient games, by Derek Gatopoulos.